Chicken continues to be the most popular meat in America and for good reason; it is a versatile lean protein that can be prepared quickly for weeknight dinners and simple, healthy chicken recipes abound. No surprise that the most popular recipe on She’s Cookin’ is one that I shared by the beloved Barefoot Contessa, Ina Garten, when her cookbook, “BarefootContessa, how easy is that” was released in 2010. Ina’s Lemon Chicken Breast fits nicely into my Low Sodium niche as it is enhanced by wine, fresh lemon and sprigs of thyme – three of my favorite replacements for salt to boost flavor. It also is not brined – something that many restaurants do to ensure a juicy chicken breast, but a process that adds a considerable amount of sodium to chicken, which is it makes it to The Salty Six by the American Heart Association. Shocker, I know! Back in 2010, I was featuring Top Moms who loved to cook, and Ina’s Lemon Chicken Breast was contributed by my friend Kathleen who had attended a book signing at Williams and Sonoma and was beyond excited to meet one of her kitchen idols. Kathleen’s question for Ina was, “What is your favorite recipe from the book?”, and Ina response was the Lemon Chicken Breast, which made it the first recipe that Kathleen cooked. Always thinking, Kathleen, even brought a wooden spoon that Ina signed. And now for Ina’s favorite recipe from “Barefoot Contessa, how easy is that?“. A no-fuss main that's perfect for entertaining or a weeknight dinner - no wonder it's Ina's favorite dish from her book Barefoot Contessa "how easy is that". Warm the olive oil in a small saucepan over medium-low heat, add the garlic, and cook for just one minute — but don't allow the garlic to turn brown. Off the heat, add the white wine, lemon zest, lemon juice, oregano, thyme and 1 teaspoon salt, and pour into a 9-by-12-inch baking dish. Pat the chicken breasts dry and place them skin side up over the sauce. Brush the chicken breasts with olive oil and sprinkle them liberally with salt and pepper. Cut the lemon in eight wedges and tuck it among the pieces of chicken. Bake for 30 to 40 minutes, depending on the size of the chicken breasts, until the chicken is done and the skin is lightly browned. If the chicken isn't browned enough, put it under the broiler for two minutes. Cover the pan tightly with aluminum foil and allow to rest for 10 minutes. Sprinkle with salt and serve hot with the pan juices. Eliminate the salt for low sodium diets. Add more wine if you prefer a saucier chicken. Nutrition Analysis via MyFitnessPal.com. Eliminate salt for low sodium version. I made this tonight. I was hoping for more flavor. It was kind of boring. I made recipe exactly as written. I used a Chardonnay for my wine. There was lots of juice in the pan but the flavor just did not get into the chicken. Yes I used boneless with the skin from whole foods. Recipe going in the trash. Sorry Ina. I love the post. And your new photos in your Banner are fantastic, just like you. So funny…Zomppa Patty has a she-crush on her too!! Happy for you for meeting her! What a great post, thanks for sharing it! The recipe looks amazing too. It is always so nice to meet people that you really look up to! What a great recipe! (And, I’m so sad I missed this opportunity to meet Ina.) We actually have everything we need in the garden right now to make this. Perfect for a mid-week dinner. Hi Kathleen…thank you for sharing this delicious recipe with me. I love chicken breasts, and I’m always looking for new ways to prepare them. You can never go wrong with Ina! Thank you for sharing, sweet woman. May your Sunday be one of peace and love. 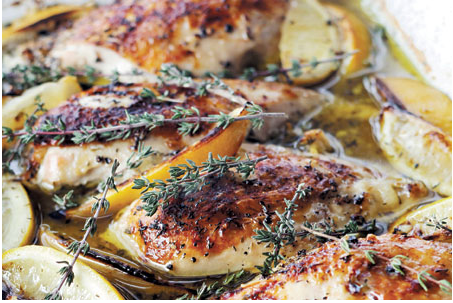 Such a fun experience and the chicken sounds lovely with the lemon flavor and fresh thyme! Nice! How awesome is this? Delicious recipe – my mouth is watering! You can never go wrong with one of Ina’s recipes! made this last night and left cookbook at the office. This post saved me. So so good. I used bone in chicken breasts and had to cook a bit more. Ina is my favorite food network star! I have made several of her recipes and have enjoyed them all. I plan to prepare her lemon chicken recipe for dinner tonight and look forward to serving this to my family. Thanks!!!!! LOVE Ina Garten! Watched her make this recipe yesterday and then looked it up online to discover this post. Made it last night and it came out great. I used skin-on, bone-in split chicken breasts which is what my grocery store had available and it worked. Would have preferred bone out, skin on, but unless you go to a butcher, it’s difficult to find. Also didn’t have fresh thyme. I used an Italian spice mix which was great, but I’m sure the fresh herbs would have really knocked it out of the park. @Liz Ann – Glad you found her recipe here 🙂 It’s such a simple recipe that yields great results! Hi, I found this recipe on Pinterest, and OMG this was the most delicious chicken in the world! Dare I say, my absolute favorite EVER! Thank you SO SO much for posting this recipe. It was absolutely divine! I’m sitting here shaking my head at your sheer genius. A spoon. You had her sign a spoon!!! Years ago I made the rounds of food shows and cooking classes amassing a good-sized collection of signed cookbooks… which are all now tucked away in a back room on shelves. But a spoon! I could have a Julia Child-signed spoon right there next to the stove every. single. day. I can’t seem to fine chicken breast with the skin on. Any suggestions? Will skinless ones work? Hi, Lauren – Yes, skinless will do. Isn’t it crazy – you can hardly find skin on chicken breasts or thighs anymore unless you buy a whole cut-up fryer! This was absolutely delicious. I did not have fresh thyme on hand, but I plucked about 8 sprigs of rosemary from my back yard and I added that to the brew. I used bone-in split chicken breasts and the baking time was still 40 minutes. My chicken was 170 degrees when I took it from the oven to let it sit, and was extremely moist, with beautifully roasted skin, and deliciously flavored. The dish was satisfying but clean and fresh. I served this with roasted vegetables – carrots, red onion, asparagus, and potatoes. My family thinks I have a hint of culinary genius in me, My real genius is having the good sense to channel Ina when I cook! 🙂 Ina, thank you for your wonderful recipes. They are all perfection with great instructions that don’t keep you guessing!!! Thank you! This is one I will make again. Hi, Sandra! Thanks for taking the time to leave such a wonderful comment. You’re absolutely right, we can always rely on Ina – she’s the best! Owwaoo chicken! I really love your lemon chicken. I think when it was made then it gave`s nice smell, because it looks really delicious. Thanks for nice sharing. Made this tonight with boneless skinless chicken breasts (that was all they had at my store …) I used the exact ingredients just added some garlic powder and lemon pepper to the chicken before cooking. Cooked on 375 for 35 minutes. Seriously DELICIOUS my chicken is so tender. Thank you! Has anyone added potatoes in with this dish? I am wondering if you could add potatoes to the dish to give them the flavor also? Any thoughts and do you think they would have the same cooking time? Hi Priscilla! Thank you for your suggestions. I did make the potatoes separately, cutting them into wedges. I did like how they turned out because they still got crispy and not soggy (as I suspect they would if included). I used the same flavorings and tossed the potatoes in them prior to cooking. I then used some of the pan sauce at the end when serving. The next time I make this recipe, I think I would add more stock or more liquid at the end to the pan to make more sauce. I did not find that there was much liquid left in the bottom of the pan.